Erik C. Spayde, MD is fellowship trained Spine Surgeon with expertise in the treatment of neck and back disorders. He has over 10 years experience in treating disc herniations, spinal stenosis, spondylolisthesis, kyphosis, scoliosis, and spine fractures. His expertise in multiple complex spinal disorders and breadth of training allows him to choose the proper treatment modality for his patients. His primary research interest is in artificial disc replacement and he has specialty training in cervical and lumbar disc replacement. Dr. Spayde received his undergraduate degree in Biological Science from Stanford University he graduated Phi Beta Kappa with honors and distinction in field of immunology. He graduated from Harvard Medical School where he was awarded research grants from the NIH/Howard Hughes Medical Institute and the Arthritis Foundation. He completed his internship in surgery at Brigham and Women’s Hospital in Boston. He was selected by the Harvard Department of Orthopedic Surgery to complete his residency training at Massachusetts General Hospital in Boston. After residency, Dr. Spayde obtained further training in complex spinal-reconstruction surgery at The Spine Institute at St. John’s Health Center in Santa Monica. 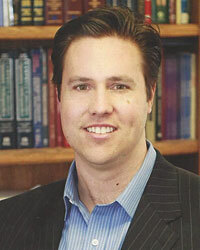 He is a board-certified orthopedic spine surgeon. Dr. Spayde has presented research at national and international spine meetings and he has published numerous scientific articles. Dr. Spayde remains active in education, research and innovation. He has designed numerous surgical implants and novel technologies to better treat patients around the U.S. and abroad. He has been involved in clinical trials developing artificial disc replacement devices. Currently, he is a member of the Harvard Medical Alumni Association, American Academy of Orthopedic Surgeons, and Phi Beta Kappa Honor Society. Dr. Spayde’s office is located in Thousand Oaks, CA. 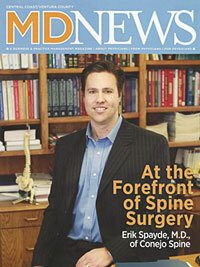 His goal is to provide a comprehensive treatment approach to patients with spinal disorders. Dr. Spayde performs spine surgery at Thousand Oaks Surgical Hospital, Outpatient Surgery Centers and Los Robles Regional Medical Center. At Los Robles Hospital, he leads their innovative spine program which strives to offer cutting edge technology, minimally invasive surgery, and high quality patient care. Dr. Spayde has presented research papers at national and international spine meetings on some of the most innovative techniques in spinal surgery. He has published numerous articles in peer reviewed scientific journals. Click on a heading below to view more of Dr. Spayde’s research. Shen, B. Pradhan, H. Bae, M. Kropf, E. Spayde, R. Delamarter. Single-level Artificial Disc Replacement at L4-5 versus L5-S1—Is There Any Difference in Technique, Morbidity, or Result?. The Spine Journal, Volume 6, Issue 5, Pages 101S-101S M.
Bae H, Lanim LEA, Spayde E, et al. Does Autologous Bone Marrow Aspirate Enhance Graft Effectiveness for Spinal Fusion? Seminars in Spine Surgery Mar 2006 18:1. Spayde EC and Bae H. Posterior revision strategies for dural and nerve root exposure following a previous laminectomy. Tricks of the Trade 2nd ed. 2006. Spayde EC, Ting J, Glazer P. Biomechanical Evaluation of Z-Fiber Technology in Fracture Fixation. Orthopedic Journal of Harvard Medical School. 2005 July. Spayde EC. Joshi AP. Wilcox WR. Briggs M. Cohn DH. Olsen BR. Exon skipping mutation in the COL9A2 gene in a family with multiple epiphyseal dysplasia. Matrix Biology. 19(2):121-8, 2000 May. Spayde EC, Olsen BJ. Intronic Splice Junction Mutations in COL9A2 and COL11A1 Genes in Knee/Shoulder/Hip Osteoarthritis. Abstract/Oral dissertation: Proceedings of Howard Hughes Medical Institute 1999 May. Castro BA, Spayde E, Hotz R, Leu K, Shi S, Weidmann TW. Restoration of Natural Killer Cell-Mediated Antiviral Immune Response in Lethally Infected Immunocompromised Mice. Abstract:9th International Congress of Immunology. San Francisco, CA 1995 July. Spayde, EC. Restoration of Natural Killer Cell-mediated Cytotoxicity in Lethally MCMV Infected, X-Irradiated Mice by Plant Extract PG36 Involved in Viral Resistance. Stanford University Honors Thesis. Stanford, CA 1995 June. Reginato A, Spayde EC, Olsen BJ Analysis of Collagen IX gene mutations in hereditary lumbar disk disease. 2005. Spayde E, Shen M, Pradhan B, Bae H, Kropf M, Delamarter R. Single level artificial disc replacement at L4-5 versus L5-S1. Is there any difference in technique, morbidity, or result? IMAST 13th International Meeting on Advanced Spine Techniques, July 2006 (Athens, Greece). Spayde E, Pradhan B, Bae H, Kropf M, Delamarter R. Charite-III versus ProDisc-L Early Head to Head Results in a Single Institute. IMAST 13th International Meeting on Advanced Spine Techniques, July 2006 (Athens, Greece). Spayde E, Pradhan B, Bae H, Shah TJ, Hussein T, Delamarter R. Return to Work Outcomes After Lumbar Artificial Disc Replacement – Using a Standardized Evaluation Questionnaire. IMAST 13th International Meeting on Advanced Spine Techniques, July 2006 (Athens, Greece). Spayde E, Delamarter RB, Bae H, Pradhan B. Lumbar Spinal Arthroplasty Work Comp. versus Non-Comp. Prodisc-L. Annual Meeting of American Academy of Orthopaedic Surgeons, 2006 (Chicago, IL). Spayde EC, Ting J, Glazer P. Biomechanical Evaluation of Z-Fiber Technology in Fracture Fixation. Annual Harvard Orthopaedic Surgery Resident Thesis Day, 2005 (Boston, MA). Spayde EC, Olsen BJ. Intronic Splice Junction Mutations in COL9A2 and COL11A1 Genes in Primary Knee/Shoulder/Hip Osteoarthritis. Annual Meeting Howard Hughes Medical Institute/NIH of Medical Student Research Fellows, 1999 (Bethesda, MD). Spayde E, Pradhan B, Bae H, et al. Return to Work Outcomes After Lumbar Artificial Disc Replacement. Spine Arthroplasty Society 2006. (Montreal, Canada). Learn more about a variety of minimally invasive surgical procedures and non-surgical treatment options for spine-related pain and conditions. For your convenience, please print and fill out all applicable forms and present them to the front desk when you arrive for your appointment.